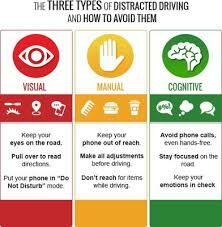 Distracted driving is dangerous driving behavior. It is a problem for all age groups, not just young people. Distracted drivers cause an average 40 crashes each day in Colorado. 91 percent of participants reported driving distracted in the past seven days. 48 percent admitted to reading a message on their phones. 63 percent of drivers talked on a hands-free phone. 52 percent talked on a handheld phone. 33 percent sent a message while driving. It is a problem for all age groups, not just young people.It is especially important to educate young drivers about the dangers of distracted driving.Distracted driving can bring about tragedy. Casey Feldman was 21 years old when she was killed by a distracted driver in 2009. Her parents created The Casey Feldman Memorial Foundation and EndDD.org to honor Casey’s life and help stop the crashes and deaths caused by distracted driving. Our firm supports the End Distracted Driving campaign.The are features for cell phones to block calls and texts while you are driving. The Colorado Department of Transportation discusses these applications in an effort to reduce distracted driving fatalities and injuries. Lee, Myers & O’Connell encourages everyone to take the pledge to be a safer driver. I would strongly recommend Lee, Myers & O'Connell! I worked with Brett Myers and Jacquelyn Yellowmoon on my case. I was in an accident where we were re-ended with my young boys in the car. Throughout the process, they checked in just to see how my kids and I were doing. They were quick to respond to questions and they were patient with me when I was not! I was pleasantly surprised at the final outcome and even though my case was a 'small one,' they worked hard and I would absolutely recommend Mr. Myers! Mr. Lee has been nothing short of extraordinary in helping my wife and I handle a settlement from a car accident my wife was in. After the initial meeting, and after receiving all the details, Mr. Lee worked diligently to ensure all our needs were met and with little amount of headaches as possible. We never once had to call the insurance companies because Mr. Lee and his team did all the leg work for us. We ended up receiving a settlement we felt was fair and just for the inconvenience and pain my wife had to endure. Without Mr. Lee and our colleagues we would not have been able to close out this difficult chapter in our lives. Lee Myers & O’Connell is amazing. The staff is extremely professional and helped me every step of the way with my case. They addressed all my needs and were always available for any questions or concerns I had. Highly recommended. We represent pedestrians, bicyclists, people traveling on the road who have been injured by someone using a cell phone or other device. It is important to contact an attorney so that the attorney can address distracted driving issues early on in the case. You can chat with us now, Lee Myers, & O’Connell, for a free consultation about your rights or call us.